Some exciting comment is to be made ten minutes in. The first appearance of talking money? Lots of old style jokes through out the episode. Fry's scratch lottery tickets being the way for him to lose money was to be much longer and was based on David's mother having won $100 in tickets, spending the winnings on another $25 in tickets, then $4 then none. They didn't include "Oww my side" as it wouldn't be as funny. Dr. Perceptron's sparks are hand drawn. When planning episodes they use coloured cards with writing, the blue ones, used frequently, have "trial", "run away" and "tour" all of which are used here. That robots are built to be insane, like the mad hatter robot. The Crickets being crazy was David's idea, he apparently was the only one who wanted them. Difficulty of conveying emotion through robots and that a Cyclops is actually harder. 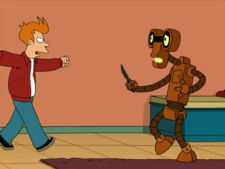 Fry's "Battle droid" attack is like one used in The Simpsons which Matt and his sister used when they were kids. They made sure to keep Roberto alive. Talking about what the original closing scene was going to be. Unknown: There's not many ways to mess up stabbing. Unknown: I still don't buy that Zoidberg wouldn't eat one of those sandwiches. The alternate closing scene discussed is found on the DVD as a deleted scene.